The SRAM S-Series 10-speed Grip Shift twist shifters are smart. It’s sometimes is tough to shift with frozen fingers or with thick heavy gloves on. If you are running bar mitts, the twist shifter makes even more sense. 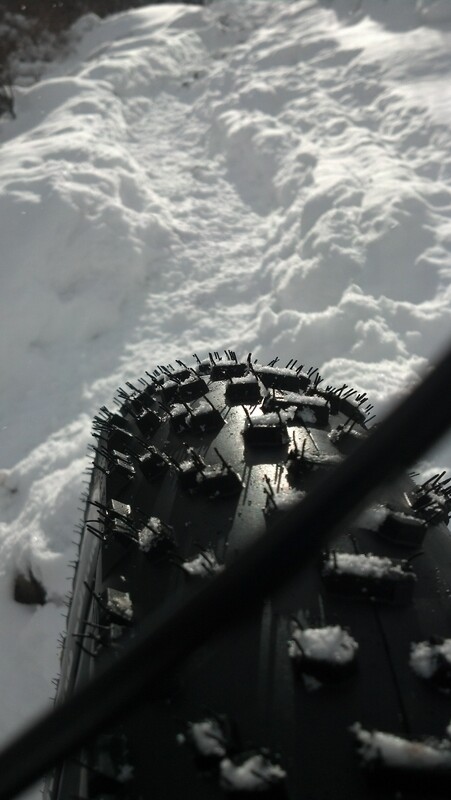 4.6″ Ground Control Tires grip incredibly well. 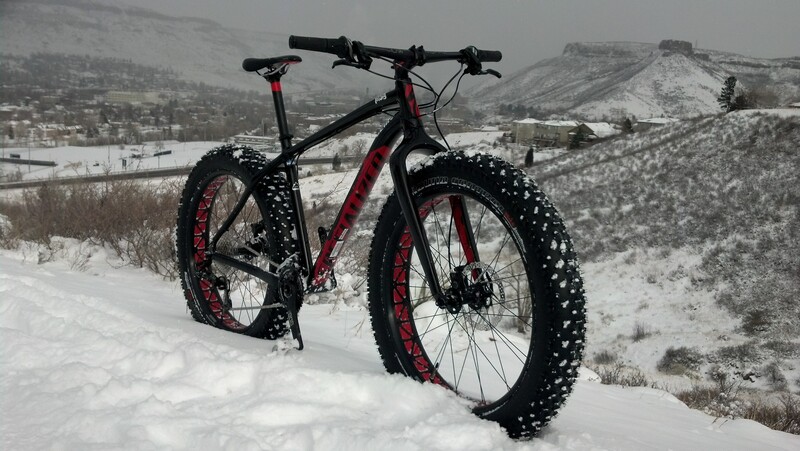 You can run these 1420 gram tires at 5-30 psi. 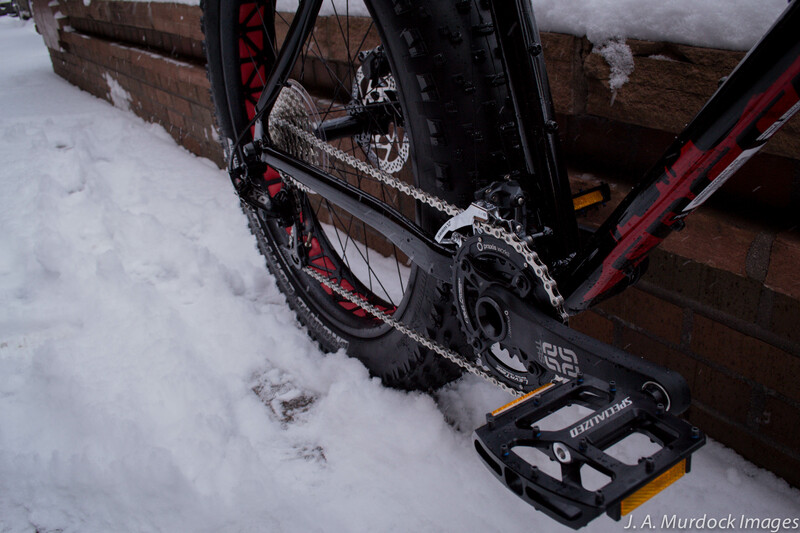 They are easy to convert to tubeless which brought the stock bike weight down to 29.2lbs with pedals. On this 7 degree day I used 6psi in the rear and 5psi up front. 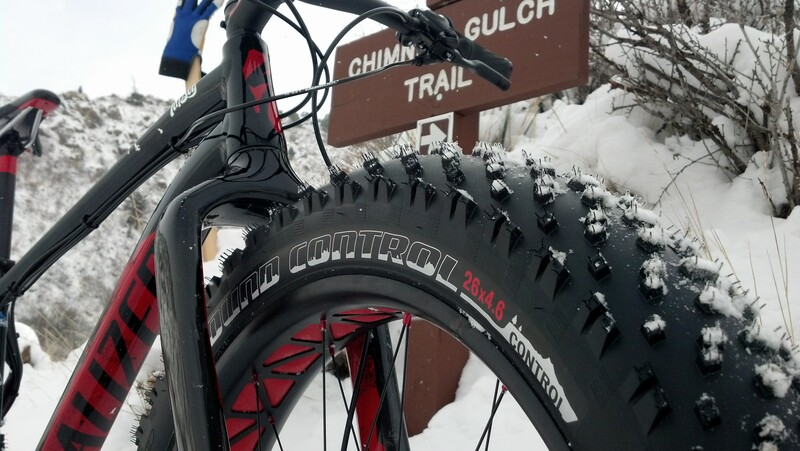 Plenty of traction to climb Chimney Gulch in Golden, CO. This is a steep climb and the traction blew me away. 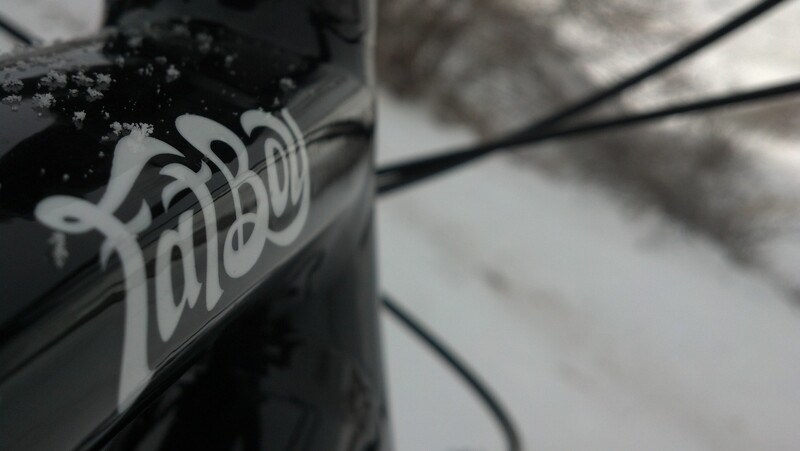 A tapered headset and carbon fatty fork keep the bike going in whichever direction you point. The entire package is stiff. Running tires this big requires a stiff frame or you will be all over the place. Not the case with this frame and fork. 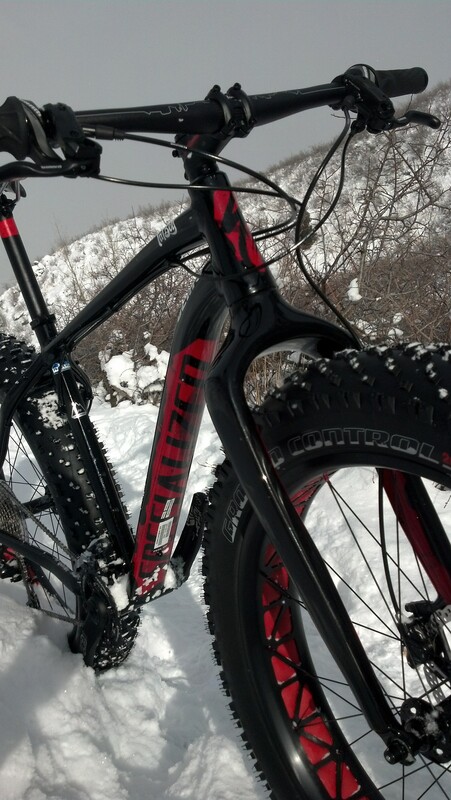 Stiff and light, just like all of Specialized performance bikes. Clean and muted graphics give this bike it’s own quiet style. Nothing loud other than performance on this bike. Just in time for a snow day! 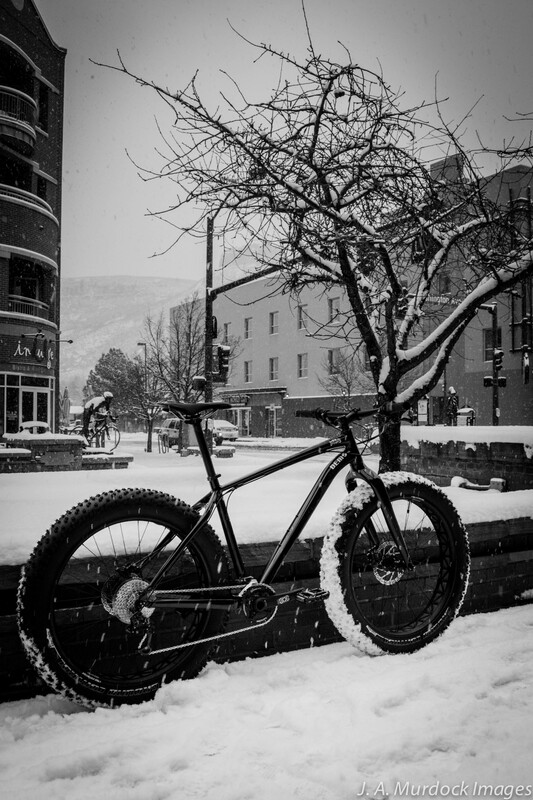 This entry was posted on Monday, January 13th, 2014 at 5:53 PM and is filed under Featured Bikes. You can follow any responses to this entry through the RSS 2.0 feed. You can leave a response, or trackback from your own site. Any suggestions for making this rim/tire combination tubeless? 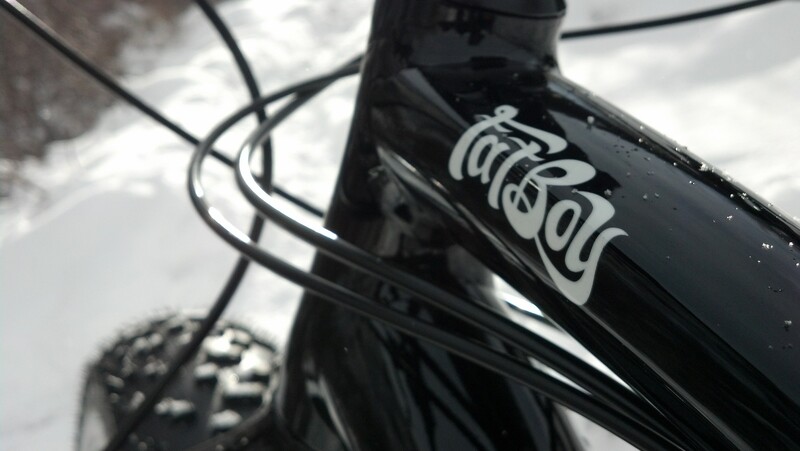 I’ve been doing a bunch of Surly tires on Rolling Darryl rims, but we are also selling lots of Fatboys at the shop I work at. Thanks. We would highly recommend the Specialized rim/tire combo for tubeless. We’ve been able to set these up just as fast as a lot of regular MTB tires/wheels. We use gorilla tape to seal the rim (one strip left, one strip right) and 3 to 4 cups of Stan’s sealant. Other than that it’s a fairly regular setup. We have noticed that rear wheels are tougher to seat/seal than front… maybe a difference in spoke tension changes the wide rim’s profile or diameter a tad. Best of luck!